Theological Stew - How Many Stones? Don’t you love how the Bible is filled with stories of scandal? And don’t we love to catch each other doing something wrong? It gives us such a rush. In fact it's what modern media is all about. Of course magazines and newspapers have known for years that scandal sells; and not just the ones we call “rags.” Scan today's Sunday Inquirer (or whatever you read) and see how many stories of wrongdoing are in the headlines alone. We have countless TV programs, fiction or not, that depict people being “caught in the act” – and they are on every station from FOX to the History Channel to MTV. And these shows are so popular! Why do we love them? Somehow, as bad as this will sound, we enjoy seeing someone else “found out” or “brought to justice” or “getting what they deserve.” It almost fills a need in us; maybe it makes us feel better about ourselves, or the things we do, or the guilt we have, or the credit we don’t get… Perhaps if we can find others guilty it relieves our own guilt- if we discredit someone else, we add credit to ourselves…. I don’t know. But I do know it has become a sad day in our society that we now look to other's misery as a form of entertainment. But people are people. First century people were really not so different from us, minus the technology. So the scene of the woman being caught in the act of adultery could have happened in first century Jerusalem in the temple, or it could have happened on Jerry Springer. "Let's bring out our first guest. Here he is, a preacher, a rabbi and a teacher... an expert in all things God… Please welcome Jesus of Nazareth!" And to mad applause, hoops and hollers, Jesus, carrying a coffee mug in one hand and giving a small wave to Jerry with the other, walks center stage and then sits down in the armchair. Jerry asks him a few warm up questions about his education… his teachings and his beliefs… and the audience is buying in nicely. Jesus is charismatic, smart, witty… we love guests like that. And from behind the set, come two burly security guards who look more like bar bouncers than cops, and they are dragging between them a scantily clad, screaming woman. And the bouncers sit the woman into the armchair next to Jesus' seat… and once seated, she stops her screaming, crosses her arms and legs, looks off camera and purses her lips. “Audience, let me introduce you to Candy! Candy, do you want to tell us where you were just half an hour ago? Where were you when these men found you?" Candy looks at Springer and shouts out some expletives that we don’t say in the sanctuary… and then spits.. and spits again… and audience goes crazy! And he pushes harder... "Jesus! So what do you think… Candy here has been caught in the act of adultery… and so by the law, in fact by your own law you claim to love, she’s got to pay… she’s supposed to be stoned to death." Springer: "Now, as someone who loves the law, you would have to agree with that punishment, wouldn’t you Jesus? Springer can’t take it… his show is all about getting people flustered- if there’s no blow up, there's no show! But Jesus continues to sip away, even stops between sips to take in the coffee aroma. And then Jesus puts his coffee mug down and faces the camera. Jerry quiets the audience… “Let him speak…Let him speak!" Silence fills the studio. Show's over… And then one by one, starting with Springer, people begin to filter out of the studio. Notice that the woman never asked to be forgiven. She didn’t repent for what she had done. She showed no remorse; whether she was set up (which she probably was) or whether she knew she was committing adultery. She didn’t even present herself before Jesus. Yet He offers her a clean slate. He offers her total forgiveness; and does so, not with a head shake or an eye roll or a disgusted look. Jesus needs no convincing or prodding to forgive this woman. But here we see an example of Jesus’s unconditional acceptance and unmerited forgiveness… even before a word is spoken. I would like to think the woman took Jesus’s advice and was able to live out everything God had planned for her, and never let herself come under the thumb of accusation and sin again. But more likely she acted like most of us do… we don’t really 'get it.' We don’t embrace the truth that we are really set free from sin and we can live in freedom. And like the Pharisees who were accusing this woman in order to (as the Greek translates) ‘accuse’ Jesus, we continue to find fault with one another, and ourselves. Did you ever stop to think about accusations? When we make accusations, underneath we are after something else. All of us, on some level have bought into the lie that we are somehow unacceptable- unforgivable. (We talk about this every week) We try… oh Lord, we try to be good. And that feels good to us, to think that there is actually something that we can DO to remain good. Because GOOD people are the people God loves. GOOD people get into heaven! And we like being in control of our own destiny! What power! So, by accusing, we want to prove that God has limits… that God really isn’t all powerful, all forgiving, all loving; that we can’t just do whatever we want and still get off the hook for it… that we can’t have our cake and eat it too. Take a count in your head of how many stones you have thrown just this week; hell, just today (or since you walked into church this morning?) 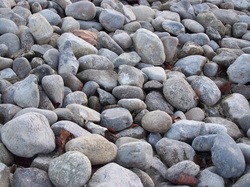 How many stones have you thrown at others… at yourself… at God. A Pastor in Southern NJ who is passionate about helping people understand God's unconditional love and acceptance.